Sparked by a discussion in the ning Library 2.0 forum, I recently revamped my Library's 404 error webpage (what displays when the webpage someone is looking for is not found). Until earlier this year, we just had the standard "404 error: file not found" page, which is common and boring. I had made it a little more interesting just by adding our logo and some helpful information. But Darlene's call for injecting humor and casualness in this situation got me to rethink it, and I came up with our current page. Libraries are always fighting the traditional stuffy stereotype, and little things like this can make the patron experience more interesting and memorable. Also, it really was fairly easy to do, and I think in this case, a little effort goes a long way (of course, ideally, this page would never be seen). But let your 404 page be seen - Darlene also started a flickr Library 404 Page group, so please add your screenshots. 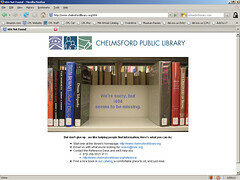 Also, some live, non-library examples are available at sendcoffe.com. And before anyone asks: I didn't put too much thought into the books in the photo. This is just the shelf closest to the Reference Desk. But really, I think these titles lend themselves pretty well to the process of discovery of something missing - plus, this is the "self-help" section.